Presidential pardon rules are established by the United States Department of Justice. These rules govern how and when the Office of the Pardon Attorney within the White House will evaluate your request for a presidential pardon or clemency. "....shall have power to grant reprieves and pardons for offenses against the United States, except in cases of impeachment." U.S Const. Art. II, Sec. 2 Cl. 1. This specific provision of the U.S Constitution gives the president an almost unlimited power to grant any pardon to someone who was convicted for federal crimes. Unfortunately, the president does not have any power to issue a pardon for a state conviction; those crimes must generally be pardoned by the state governor. This article discusses the presidential pardon rules governing federal crime pardons only, but you can locate more information on state pardons by reviewing other articles on our website or by visiting the following link here. Although the presidential pardon rules are technically not binding on the President, they are followed in the overwhelming majority of requests for pardons. Any application for a presidential pardon which is submitted through the Office of the Pardon Attorney will be considered and granted (or denied) based on these rules. This means that anyone seeking a presidential pardon must know the "rulebook" and how to use it. Many people looking for information about how to receive forgiveness from the U.S. president for a sentence they already served will run into a number of terms which are often used interchangeably. Clemency, pardon, and commutation are frequently used words to describe the powers of the executive branch to alter the consequences of a criminal conviction. How each of these powers are used in practice is set out in the presidential pardon rules discussed more below. However, each of these three different terms has a specific meaning and it is important that we distinguish between these three terms from the start. Clemency is the broadest term used to explain the authority granted to the president for altering the consequences of convictions for offenders of federal laws. Clemency can be in the form of presidential pardon or in the form of commutation of sentence. So all presidential pardons or commutations of sentences are a type of clemency. Not all clemencies are presidential pardons. Similarly, not all clemencies are commutations of sentences. Commutation of a sentence modifies the sentence to be served by a person convicted of a federal offense. A sentence may be commuted in full or in part. When a sentence is fully commuted there are typically no further terms of imprisonment, and any financial penalty imposed can also be changed or waived. A partial commutation of a sentence modifies only a portion of the remaining sentence. Usually, this means that the length of prison time remaining which must be served by a person is reduced, but not entirely wiped out. Under these circumstances, a person who receives a partial commutation still has additional prison time to serve, but it is less time than before the partial commutation. A partial commutation can also modify the financial penalty imposed by a sentence as well. How and when a commutation is granted is set out in great detail in the presidential pardon rules, which are discussed further below in this post. For example, let's assume that Edward Snowden returned to the U.S., was charged under the Espionage Act, and was sentenced by a federal judge to serve a lifetime sentence in prison. The U.S. president could exercise his power to grant a full commutation of Snowden's sentence which would allow him to walk out of prison the next day. Alternatively, the president could grant Snowden a partial commutation and modify his prison sentence to allow him to leave prison after 20 years. Receiving either a partial or full commutation of a sentence does not reverse a conviction. A commutation does not allow a person to restore their civil rights which were lost as a result of a conviction. Commutations, as opposed to presidential pardons, cannot change any immigration status or prevent any deportation, removal, or extradition proceedings. Commutations only change the terms of the sentence that was already imposed and what you are required to do as a result of that specific criminal sentence. Even a full commutation does not change any of the secondary consequences that are based on a federal conviction. These consequences include the loss of civil rights, the inability to own a firearm, and many other impediments which are too numerous to list here. A presidential pardon refers to the president's use of his power under the U.S. Constitution to grant formal forgiveness to anyone for the commission of any federal crime. Unlike a commutation, presidential pardons also wipe away all of the "disabilities" (collateral consequences) which are imposed along with a federal criminal conviction. 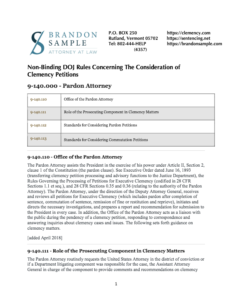 Pardons are granted generally based on the application of the presidential pardon rules to your particular case and after a positive recommendation from the Office of the Pardon Attorney. This means that only a presidential pardon can fully restore your civil rights if you previously were convicted of a federal crime. A Presidential pardon will allow you to vote, own a firearm, receive student aid, and participate in other government programs which otherwise bar convicted people. Presidential pardons can also alter any fines, penalties, or restitution that you were ordered to pay as part of your criminal sentence. For example, let's go back to our example above and assume that Edward Snowden was convicted under the federal Espionage Act and sentenced to lifetime imprisonment by a federal court. If Edward Snowden received a presidential pardon, he could walk out of jail tomorrow. This is similar to how a full commutation of his sentence would work. Let's also assume that once Edward Snowden walks out of jail he decides to live in Florida. Whether or not a convicted felon is allowed to vote in state or federal elections is determined by state law where a person lives. Florida does not allow convicted felons to vote at all unless they receive a court order or governor's executive order restoring their voting rights. Even if Edward Snowden received a full commutation, he would still not be able to vote in Florida in any election. He would also not be able to own a gun or exercise many other civil liberties. However, if Edward Snowden received a presidential pardon he would be allowed to vote, even in Florida, and would not have any further restrictions on his civil liberties based on his previous conviction. Presidential pardons are similar to sentence commutations since neither implies that the individual is innocent. A presidential pardon will not change your immigration status, but pardons may eliminate the need to move forward with mandatory removal (deportation) proceedings in some cases. This is why it is so important to learn and apply the presidential pardon rules when you are seeking executive clemency. As mentioned above, there are specific rules that you must follow when you are seeking a presidential pardon. These presidential pardon rules are established by the Department of Justice and are a part of federal law. You can obtain a full copy of the current presidential pardon rules as of May 2018 by downloading the PDF file included with this post. Below is a brief you can find the full text of the presidential pardon rules. These rules describe how the presidential pardon application process operates, when you are eligible to apply, and what the pardon request must contain. You can also download a PDF document with the entire rules at the bottom of this post. A person seeking executive clemency by pardon, reprieve, commutation of sentence, or remission of fine shall execute a formal petition. The petition shall be addressed to the President of the United States and shall be submitted to the Pardon Attorney, Department of Justice, Washington, D.C. 20530, except for petitions relating to military offenses. Petitions and other required forms may be obtained from the Pardon Attorney. Petition forms for commutation of sentence also may be obtained from the wardens of federal penal institutions. A petitioner applying for executive clemency with respect to military offenses should submit his or her petition directly to the Secretary of the military department that had original jurisdiction over the court-martial trial and conviction of the petitioner. In such a case, a form furnished by the Pardon Attorney may be used but should be modified to meet the needs of the particular case. Each petition for executive clemency should include the information required in the form prescribed by the Attorney General. No petition for pardon should be filed until the expiration of a waiting period of at least five years after the date of the release of the petitioner from confinement or, in case no prison sentence was imposed, until the expiration of a period of at least five years after the date of the conviction of the petitioner. Generally, no petition should be submitted by a person who is on probation, parole, or supervised release. Petitions for executive clemency shall relate only to violations of laws of the United States. Petitions relating to violations of laws of the possessions of the United States or territories subject to the jurisdiction of the United States should be submitted to the appropriate official or agency of the possession or territory concerned. Petitions, reports, memoranda, and communications submitted or furnished in connection with the consideration of a petition for executive clemency generally shall be available only to the officials concerned with the consideration of the petition. However, they may be made available for inspection, in whole or in part, when in the judgment of the Attorney General their disclosure is required by law or the ends of justice. (a) Upon receipt of a petition for executive clemency, the Attorney General shall cause such investigation to be made of the matter as he or she may deem necessary and appropriate, using the services of, or obtaining reports from, appropriate officials and agencies of the Government, including the Federal Bureau of Investigation. (iii) Whether the clemency request ultimately is granted or denied by the President. (2) In determining whether contacting the victim is warranted, the Attorney General shall consider the seriousness and recency of the offense, the nature and extent of the harm to the victim, the defendant's overall criminal history and history of violent behavior, and the likelihood that clemency could be recommended in the case. (ii) Has on file with the Federal Bureau of Prisons a request to be notified pursuant to 28 CFR § 551.152 of the offender's release from custody. (4) For the purposes of this paragraph (b), "reasonable effort" is satisfied by mailing to the last-known address reported by the victim to the Federal Bureau of Prisons under 28 CFR § 551.152. (5) The provisions of this paragraph (b) apply to clemency cases filed on or after September 28, 2000. When a petition for pardon is granted, the petitioner or his or her attorney shall be notified of such action and the warrant of pardon shall be mailed to the petitioner. When commutation of sentence is granted, the petitioner shall be notified of such action and the warrant of commutation shall be sent to the petitioner through the officer in charge of his or her place of confinement, or directly to the petitioner if he/she is on parole, probation, or supervised release. (a) Whenever the President notifies the Attorney General that he has denied a request for clemency, the Attorney General shall so advise the petitioner and close the case. (b) Except in cases in which a sentence of death has been imposed, whenever the Attorney General recommends that the President deny a request for clemency and the President does not disapprove or take other action with respect to that adverse recommendation within 30 days after the date of its submission to him, it shall be presumed that the President concurs in that adverse recommendation of the Attorney General, and the Attorney General shall so advise the petitioner and close the case. The Attorney General may delegate to any officer of the Department of Justice any of his or her duties or responsibilities under §§ 1.1 through 1.8. The following procedures shall apply with respect to any request for clemency by a person under a sentence of death imposed by a United States District Court for an offense against the United States. Other provisions set forth in this part shall also apply to the extent they are not inconsistent with this section. (a) Clemency in the form of reprieve or commutation of a death sentence imposed by a United States District Court shall be requested by the person under the sentence of death or by the person's attorney acting with the person's written and signed authorization. (b) No petition for reprieve or commutation of a death sentence should be filed before proceedings on the petitioner's direct appeal of the judgment of conviction and first petition under 28 U.S.C. § 2255 have terminated. A petition for commutation of sentence should be filed no later than 30 days after the petitioner has received notification from the Bureau of Prisons of the scheduled date of execution. All papers in support of a petition for commutation of sentence should be filed no later than 15 days after the filing of the petition itself. Papers filed by the petitioner more than 15 days after the commutation petition has been filed may be excluded from consideration. (c) The petitioner's clemency counsel may request to make an oral presentation of reasonable duration to the Office of the Pardon Attorney in support of the clemency petition. The presentation should be requested at the time the clemency petition is filed. The family or families of any victim of an offense for which the petitioner was sentenced to death may, with the assistance of the prosecuting office, request to make an oral presentation of reasonable duration to the Office of the Pardon Attorney. (d) Clemency proceedings may be suspended if a court orders a stay of execution for any reason other than to allow completion of the clemency proceeding. (e) Only one request for commutation of a death sentence will be processed to completion, absent a clear showing of exceptional circumstances. (f) The provisions of this § 1.10 apply to any person under a sentence of death imposed by a United States District Court for whom an execution date is set on or after August 1, 2000. The regulations contained in this part are advisory only and for the internal guidance of Department of Justice personnel. They create no enforceable rights in persons applying for executive clemency, nor do they restrict the authority granted to the President under Article II, Section 2 of the Constitution. These presidential pardon rules and the pardon application process in general may seem overwhelming. If you or a loved one is looking for help with a presidential pardon application, please contact the Law Office of Brandon Sample by calling 802-444-HELP (4357) for a free consultation, or submit an online request for a free consultation. You can find more information about presidential pardon rules, applications, and executive clemency in general throughout our website. Thank you for posting these rules. My probation ends this month so this information is invaluable to me. I am contemplating application for Presidential Pardon to have my rights restored. Although my name infers that I am a man, to the contrary, I am a woman with a man’s name and also a widow.